Know when to sue if a lawyer(by deadline)shall not represent you. #YouARECapable everyone. If a social worker acts in bad faith, while your case is open as per child et.al., then, make a note of it. The "Good Faith defense" shall falter. Not appropriate,when you're suing timely, and able to prove the caseworker/social worker assigned to your case was acting in bad faith. Help Form click above or anywhere on this most imformative page. Despite what an attorney assigned usually by the state itself, who are thinly-representing a liable state employee, as case law wholly support, a "public employee/state caseworker et.al., as others state employees, have no such immunity if he or she acted with malice in committing perjury, fabricating evidence, failing to disclose exculpatory evidence or obtaining evidence by duress." despite overwhelming truthful facts; genuine issue(s)of material fact, involving such publicized and most warranted civil rights lawsuit,that deserve the right to finally go to a jury after decade of misconduct by a state agency(its individual employees) and God willing shall be going to the jury any day now during this year in 2017 as experts predict. 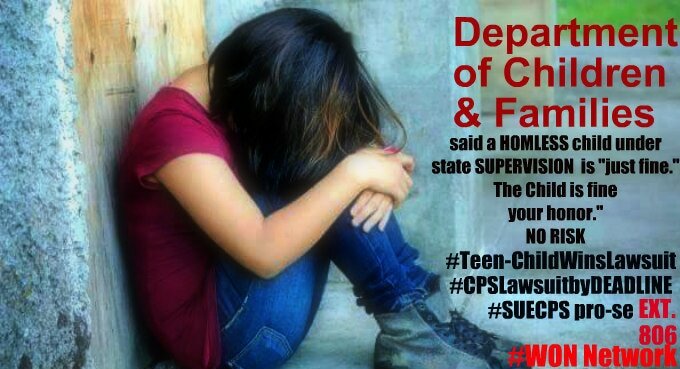 Unbeknownst to you, the loving parent, your child is now removed/forced to remain out of your secure home. Anonymous call comes into the 1-877-NJ-ABUSE hotline for example,(happening nationwide) as the call reporter cites,"serious injuries." Such anonymous call later turns out to be an ex family member, and or disgruntle ex et.al., and or other dysfunctional,jealous and or bias person and or person(s)out to cause YOU harm,as per child. Officer said the child can go home. No medical attention needed/nor imminent risk to child. No exigent circumstance. Child is allowed to go home. Cop also met with(SAME EVENING/DAY) an assigned employee for state agency, DCF. Agency worker said, "Child is fine. I agree with police dept.,and i am now going home. DCF employee goes home. -Never seeing mother/no need since there was at "this point,most relevant at jury trial..."No imminent danger." -Never needed to go and meet with the mother,when the child was already proven to not be at all, IN DANGER. At this point, you're already having at least 3 public state employees all agreeing incontrovertibly the child is fine, no imminent risk,no imminent danger,no exigent circumstances et.al., along with a police report,documentation. PHOTOGRAPHS that clearly demonstrate as police cite and worker's for the state DCF no serious injuries, no risk whatsoever. Day 1-Parent not yet spoken to/nor knew what was going on behind her back. State defendants, nevertheless told such non-parent to just "keep child here. "Do not let mom have her girls. DAY 2-Child,and her little sis, only 10 years old and age seven, were both seen, spoken to,no at imminent risk of any serious harm, and yet, were not able to return home to their own mom. 2 weeks: No court order"still. "No Warrant. . . There is no abuse that has been NOR can be proven/substantiated,against the 2 little girls,belonging to the owner/founder of W.O.N..
>Knew you're not to hide,withhold such relevant pieces of factual evidence,that would have clearly allowed a little girl and her sister to return home on schedule after a weekend visit. >Knew that you are NOT to act with malice,while knowingly committing PERJURY, when you're submitting a report knowingly false,and or altered,when your ORIGINAL report(s)clearly cite the girls are allowed to return home, and there is no imminent risk,no imminent danger, no serious injuries, NO ABUSE SUBSTANTIATED AGAINST THE PARENT whatsoever,and not cited by 1 worker but SEVERAL. When child was removed, as news media has validated prior to airing news story on such tragic case, the girls,at least one was severely gruesomely mistreated. The jury shall hear just how gruesome, with reports supporting such fact. Parent finally after years, was cleared when an"out of county"special investigator,was forced to be assigned to this most sadden case and it was all because of a caseworker (several)who were lying, defying court orders,from lower superior court to higher court orders,not for 1 day, 1 month but shocking the conscience to many for YEARS. Facts 100% TRUTH supporting damages to be awarded for mom/child/the family." of a litany of experts throughout California, NJ DE PA.,NYC tri-state to Washington,NC. NATIONWIDE. -State employee(s) multiple cite, "Child is doing just fine your honor." No risk,no concern and we can now go and close out this case,no need to keep the case open because she is fine now. -State employees cite, The girls, are just fine judge, and we are "regularly" as required by law, "visiting the children each week and or per bi-weekly,each month to make sure "with dad" they are doing well,and they are just FINE. "The girls are BOTH home living with their father, the ex spouse of the mother, and they are doing "much better living with dad,making all legal/medical decisions for the kids judge, doing "way better"with the father, and his 2nd wife,than they were doing with the mother. .No need to allow the children to "visit with mom,judge. "If the children see the mom, "it will be detrimental to both children,and put them at serious risk,harm them et.al., judge.?" - State employees cite,"The daughter's are both THRIVING." Our job as caseworker's are now "done. "'WE,have done our job here. The girls are "both LIVING WITH THE FATHER/DOING EXCEPTIONALLY WELL JUDGE "since both were removed from their mom." ​Judge(and on the record)as jury shall be able to view, cites, "Absolutely the worse case, in the entire state, his case files, that he has ever had in front of him,and or have seen in the state. ​ Experts think that says it all . 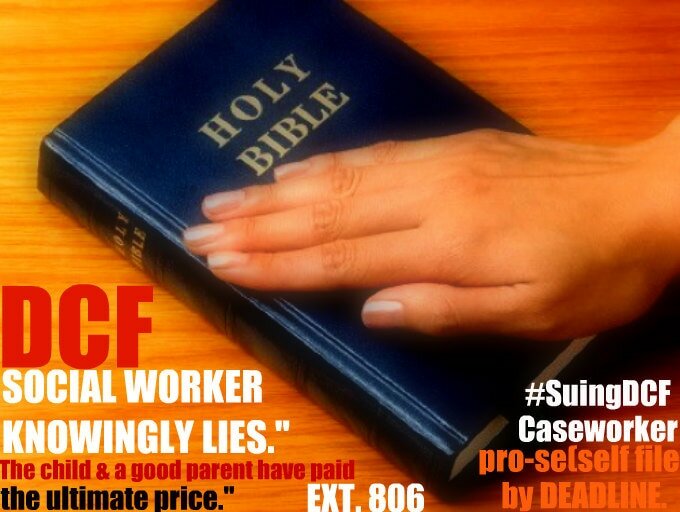 . . "
A state employee shall cite, when you're filing a lawsuit, that the Child Protection Services agency social worker, (caseworker) dcf defendant liable should still be granted "Immunity." "A public employee has no such immunity if he or she acted with malice in committing perjury, or taking part in the fabication of evidence,statements et.al., fabricating evidence, failing to disclose exculpatory evidence or obtaining evidence by duress." ​ if your case(suing cps pro-se)is analogous,and if you're executing suit against cps without a lawyer by way of pro-se method. After implementing our e-staff required e-help form, wait 30 minutes,then call in to begin your 1-on-1 POWER session,with e-staff, the owner directly."